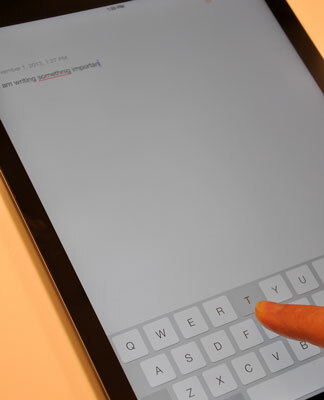 The virtual keyboards in the iPad’s multitouch interface just might be considered a stroke of genius. And (equally) they just might drive you nuts. If you’re patient and trusting, in a week or so, you’ll get the hang of finger-typing — which is vital to moving forward, because you rely on a virtual keyboard to tap a text field, enter notes, type the names of new contacts, and so on. Apple has built intelligence into its virtual keyboard, so it can correct typing mistakes on the fly and take a stab at predicting what you’re about to type next. The keyboard isn’t exactly Nostradamus, but it does an excellent job of coming up with the words you have in mind. 1See what letter you’re typing. As you press your finger against a letter or number on the screen, the individual key you press darkens until you lift your finger. That way, you know that you struck the correct letter or number. 2Slide to the correct letter if you tap the wrong one. No need to worry if you touched the wrong key. You can slide your finger to the correct key because the letter isn’t recorded until you release your finger. 3Tap and hold to access special accent marks, alternative punctuation, or URL endings. Sending a message to an overseas pal? Keep your finger pressed against a letter, and a row of keys showing variations on the character for foreign alphabets pops up. This row lets you add the appropriate accent mark. Just slide your finger until you’re pressing the key with the relevant accent mark and then lift your finger. Meanwhile, if you press and hold the . ? key in Safari, it offers you the choice of .com, .net, .edu, or .org, with additional options if you also use international keyboards. Pretty slick stuff, except you might miss the dedicated .com key that used to be on the keyboard prior to iOS7. 4Tap the spacebar to accept a suggested word, or tap the suggested word to decline the suggestion. Fortunately, Apple knows that the a you meant to press is next to the s that showed up on the keyboard, just as t and y and e and r are side by side. So the software determines that important was indeed the word you had in mind and places it in a little capsule under the suspect word. To accept the suggested word, merely tap the spacebar. And if for some reason you actually did mean to type importsnt instead, tap the suggested word (important in this example) to decline it. If you don’t appreciate this feature, you can turn off Auto-Correction in Settings. 5Put the @ in an e-mail address. If you’re composing an e-mail message, a dedicated @ key pops up on the main Mail keyboard when you’re in the To: field choosing who to send a message to. That key disappears from the first view when you tap the body of the message to compose your words. You can still get to the @ by tapping the . ?123 key. 6Switch from letters to numbers. When you’re typing notes or sending e-mail and want to type a number, symbol, or punctuation mark, tap the ,?123 key to bring up an alternative virtual keyboard. Tap the ABC key to return to the first keyboard. This toggle isn’t hard to get used to, but some may find it irritating. If you press and hold the Exclamation Mark/Comma key, a pop-up offers the apostrophe.